SAN NARCISO, Calif. (Bennington Vale Evening Transcript) -- Since North Korea’s alleged hacking of Sony Pictures, a belligerent response to the film studio’s lowbrow comedy about two TV interviewers who gain access to the rogue nation and are subsequently tasked by the CIA to kill its dictator, the DPRK has reclaimed its place in headline news. But not necessarily for what many might think. Rather than discussing the ever-erratic antics of Pyongyang’s minuscule but tyrannical autocrat, Americans are buzzing about a new fad in weight loss based on the North Korean diet of tree bark and dirt, which is sure to help millions keep their resolutions to shed unwanted pounds in 2015. The typical North Korean diet consists of tree bark, loose soil, weeds and sometimes rice, even though former ruler Kim Jong-il was known to have enjoyed lavish meals. The long-term consumption of rich meats, dairy products and exotic produce, however, likely ruined Kim Jong-il’s system, according to the emaciated doctors who were allowed to autopsy the corpse after his death in December 2011. Members of South Korea’s intelligence community found that Kim Jong-il’s policy of incrementally eliminating food for his citizens -- a move to help pay for war machines and nuclear weapons -- had yielded unexpected benefits for the world’s littlest despot. Crowley had hoped that with the loss of Kim Jong-il, the people of North Korea would revert to eating cooked meats, fish, vegetables and other nutrients that would not yield weapons-grade uranium. Unfortunately as December 2014, the third anniversary of Kim Jong-il’s death, intelligence shows that rationing and the mass internment of perceived dissidents -- or the marginally well fed -- in labor camps has increased greatly under Kim Jong-un. Because the United States and its allies have continued to impose tough economic sanctions on Pyongyang in response to Kim Jong-un’s ongoing saber rattling and aggressive buildup of nuclear weapons, the North Korean people have been left with even less to eat. And the problem has spread to those among the highest ranks of government. 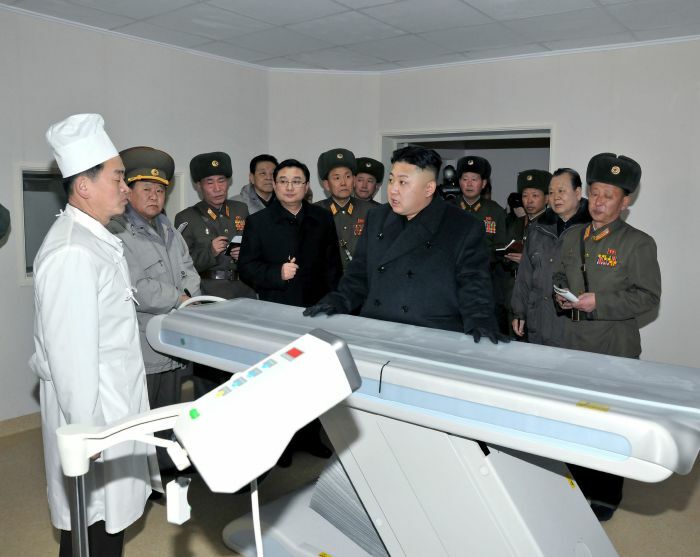 In March 2012, state media agency KCNA released a publicity photo of Kim Jong-un visiting the Taesongsan General Hospital, being constructed by the national army, as a goodwill message. But by showing a staff of chefs instead of surgeons, the grotesque horrors visited upon the North Korean people by their leaders were revealed to the world on film. Just as one person’s trash is another’s treasure, so are one people’s malnutrition and abuse another group’s miracle weight-loss systems. “Obesity continues to be a significant health concern,” said Marge Blomquat of the National Center for Health Statistics at the U.S. Centers for Disease Control and Prevention in a telephone interview. Weighing in at a biscuit shy of 300 pounds, Blomquat can no longer travel outside her bedroom for in-person press briefings. Blomquat’s studies show that the government under President George W. Bush took aggressive action to remedy the situation, with the benefits being realized only now. According to reports by the nation’s governors, as many as 27 states witnessed substantial decreases in food consumption and weight gain, especially in children, single mothers and African Americans. Fad diets have come and gone over the years. The Hollywood Diet. The Miami Beach Diet. The Economically Disadvantaged and Living on Food Stamps Diet. But nothing shows as much promise, Blomquat and others claim, as the North Korean Diet. And even the one-percent of Americans who regularly can afford to eat nutritious and freshly prepared food are jumping on board. For millions of obese Americans, 2015 may just be the year that they’re able to keep that New Year’s resolution to get into shape, thanks to the unlikeliest ally.